The walls were made of plywood covered 2x4s with steel plating on the outside walls to contain the bullets. The USPSA targets we used were mounted on bullet traps. We used frangible ammo from International Cartridge Corporation which worked extremely well (Sebastian has more on the ammo). There were buildings in various configurations including one with the building named “R U Ready High School”. 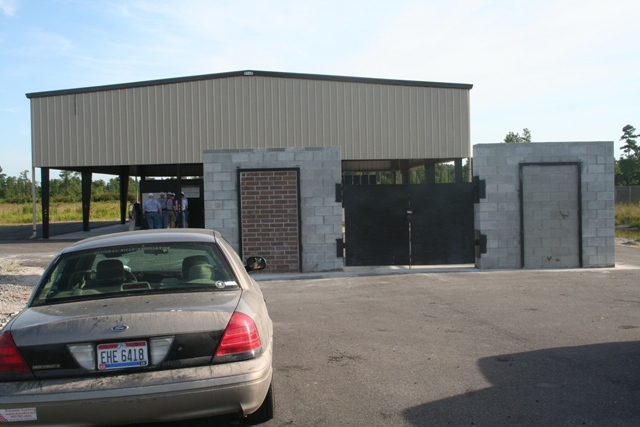 We used range T7 that could have been an office building or a home. 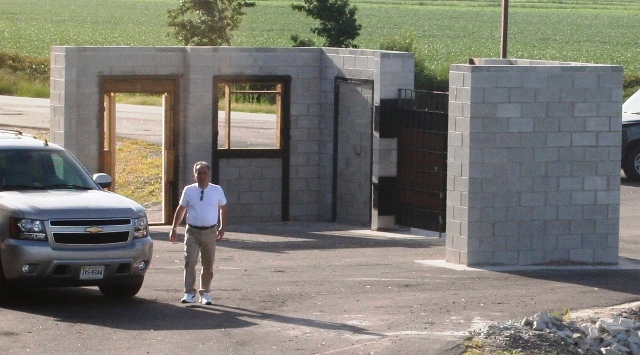 In front of our building were walls and a gate that could be used for breaching exercises. 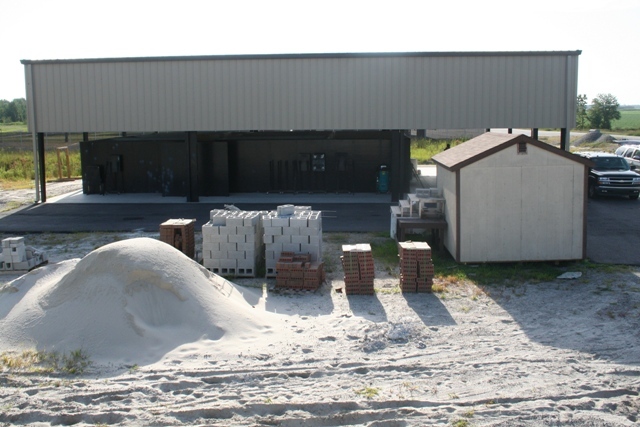 They have the repair materials for the breaching practice walls nearby. The shoot house is a metal roof with partial walls coming down from the eaves to about 10 feet above the ground. The interior with the walls, doors, hallways, targets, etc. has a smaller footprint and has about eight foot walls. Some shoot houses had catwalks overhead. T7 did not have the catwalk and the video guy had to use a ladder to peak over the walls and get his footage. Just 100 feet or so from our shoot house was this hulk. Apparently used a different type of exercise. 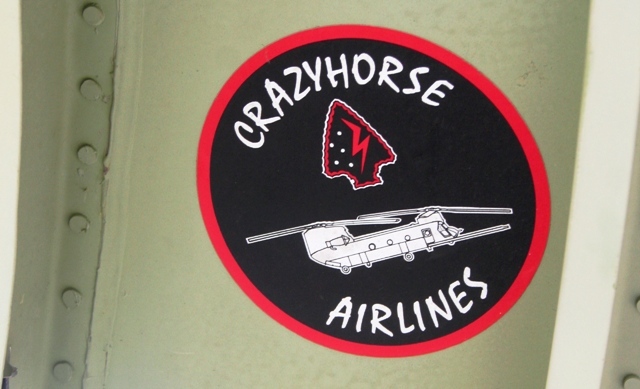 This sticker was on the inside of the plane wreckage. The white board on the front of the building shows this is really a classroom not just a place for fun. Rob Allen is supposed to report on what we saw on the white board. You won’t want to miss that post. More pictures, and drooling, about the shoot house is available here. 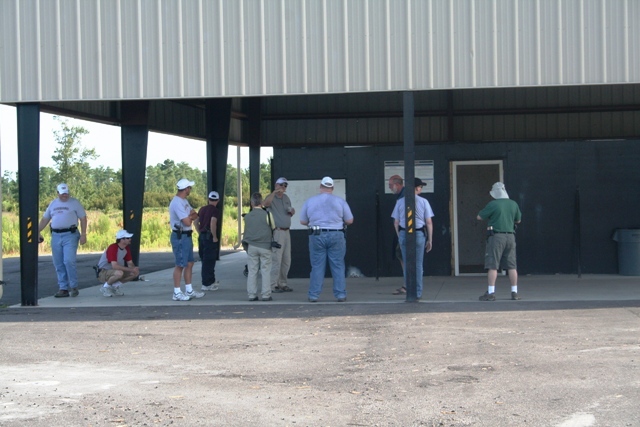 Because we could only run one person at a time through the shoot house we spent a lot of time standing around talking. Here Caleb* explains how things should be done to the rest of us. This was also the place where Caleb and I settled our bet. Originally I had suggested an El Presidenta and Caleb agreed. But it was clear it was going to be a hassle to find and set up a range for that so we agreed to use the shoot house course since that was to be timed and a winner determined anyway. I was concerned about the 9mm versus .45 aspect which the USPSA rules for the El Presidenta would have taken into account. But we were using USPSA targets here and I figured we could use the time and the hits and again use USPSA scoring and have the 9mm versus .45 disadvantage compensated for. But then the scoring was announced by Todd to be merely time with a miss counting as a three second penalty and a hit on a hostage to be a five second penalty. This put me at a disadvantage. I was shooting a high recoil gun with a Light Double Action trigger with a bug that had been haunting me anytime I tried to shoot fast versus Caleb shooting a light recoil gun with a single action trigger which was working well for him. Caleb was the second person through the shoot house and what sounded to me like an okay time. Not great but not bad. 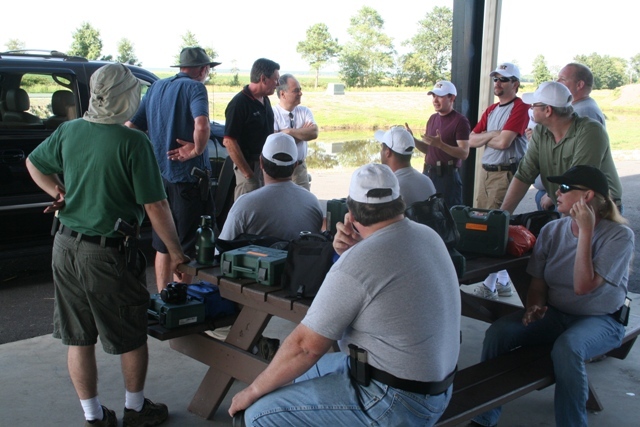 24 rounds in most types of environment should be completed in about that many seconds for an average IPSC shooter. But with the eight round magazines, numerous doors to open, and it being a surprise stage it should have taken me about 30 to 35 seconds. Caleb did it in about 46.3 (I forget the exact number on the tenths) but he hit a hostage which, according to the rules, gave him a 51.3. All I had to do, in my mind, was not make any mistakes. I went through immediately after Caleb and had at least three malfunctions of various types with the gun. I also ran down a hallway that was a dead end and had to back up to go the proper way. I made a bunch of mistakes but still turned in a time of 49.89. Good enough to win but not anything to be proud of. Caleb now owes me free ammo for life**. 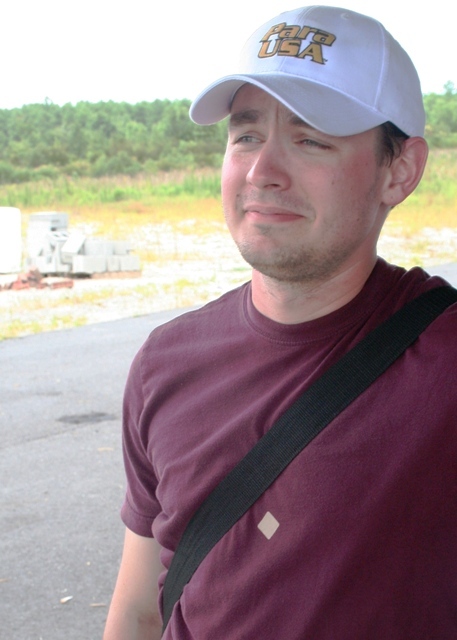 As reported earlier Caleb only cried for a little while***. The brown paster on his chest is his “badge” for shooting a hostage. * I’m kidding. Caleb was not the least bit arrogant or a braggart. I think we both knew shortly after the shooting started on Friday that it was going to be a close match. ** Just kidding, it’s two hundred rounds of 180 grain FMJ .40 S&W. *** Again, I’m kidding. The “crying” incident was two days earlier. I don’t know how I managed to get the above picture. I just took so many pictures that one of them “fell into my lap” for exploitation. I wouldn’t know what model or make it is. I have a bunch more pictures I could send you if you wanted to spend some time to figure it out. Those are the only two things it could possibly be. Pics of intact ones would verify identity. I may google, or something. Hitting a hostage target = 5 second time penalty? That’s… an interesting insight into modern tactical training. I caught that it came from Todd Jarrett, but is that representative of modern SWAT training? Yup, Google Images confirms my first impression. 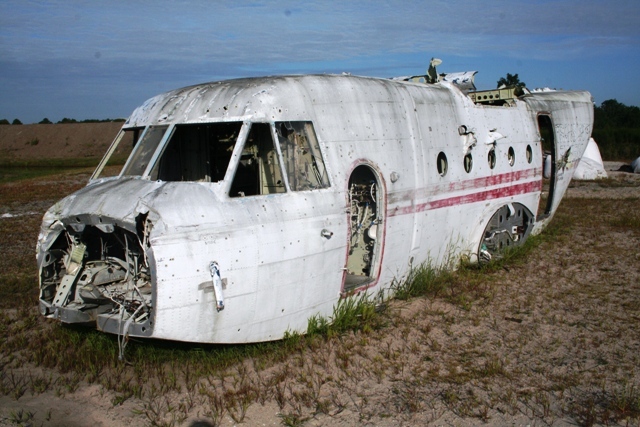 Definitely a CASA 212. Definitely. I always forget a face, but I’ll know that airplane anywhere. That’s kind of a bad-Aspie joke, I reckon. Saladman, I don’t know what SWAT training is like. The scoring could be most anything. I think it is reasonable. It’s a pretty stiff penality in terms of people that play to win. If you make the penality too harsh, like zero points for the stage, then people will train to shoot slower than they actually should. In hostage situations you are going to have to shoot fast enough to get the bad guy before he hurts the hostage, you wouldn’t have the time for a five second shot. Some risk to some hostages from friendly fire has to be weighed against certain risk if you take too long to take the shot.